The Roma Cup has always been a sentimental race for the Gangemi Racing stable with the "Nonno" of the boys Chris and Michael creating the race 51 years ago to celebrate the Italian community. There have been a few attempts along the way, but on Saturday it was fitting that the stable's best ever horse in Rock Magic delivered their most rewarding ever win. The seven year old gelding is like a fine red win - just getting better with age. 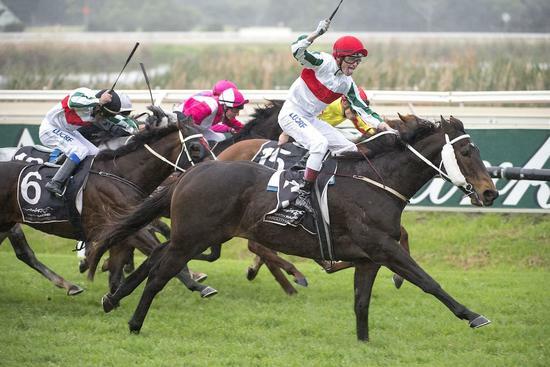 His work leading up to the 1200m Group Three race at Ascot had been better than ever. He has shown time and time again that he races brilliantly after a freshen up and Saturday was no exception. Drawn wide again, stable jockey Jarrad Noske had no option but to post wide with cover - a position that Rocky seems to relish. Rocky travelled sensationally in the run and looked to be cruising as some of the other runners were being pushed hard just to maintain a position. As they came around the bend, Jarrad pulled him out four and five wide to make his run and he rounded them up pretty quickly down the straight to win going away by a length, with Jarrad's tongue hanging out and whip in the air as if to say "how good is he"!! These were Perth's best sprinters and Rocky had them well covered, however, stablemate Durendal also ran a terrific race to run third and "the Hobbit" as he is known, showed that he is right up to them and will improve off this second run from a good spell. Rocky is the highest rated sprinter in Western Australia and the weight for age conditions races are really his only option for him to race in Perth rather than handicap races where he would have to give huge weights to his opposition. He may line up again next in Group Three Belmont Sprint over 1400m in a fortnight and then hopefully venture back to the East Coast to take on the best in the land. Whatever happens, Rocky has delivered an incredible ride for the stable and his owners, not to mention his massive band of loyal followers.